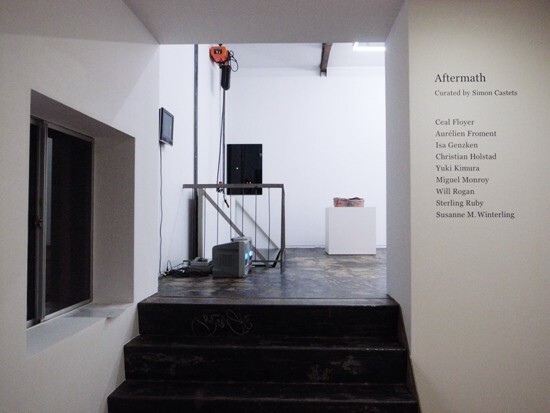 All: Installation view, “Aftermath” at Taka Ishii Gallery, Kyoto. Curated by Simon Castets. 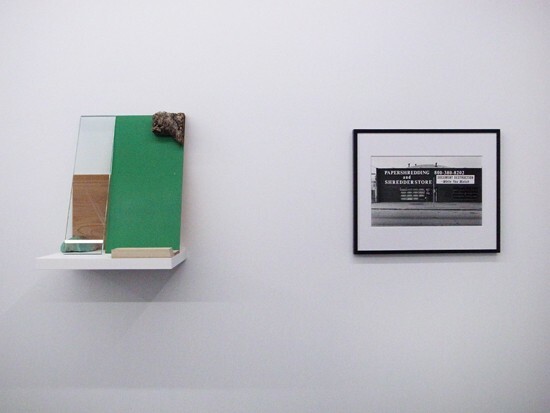 Center, on wall: From Ceal Floyer, Stop Motion (2008), black and white C-prints on diasec, 99.7 x 69.2 cm each, edition of 3. 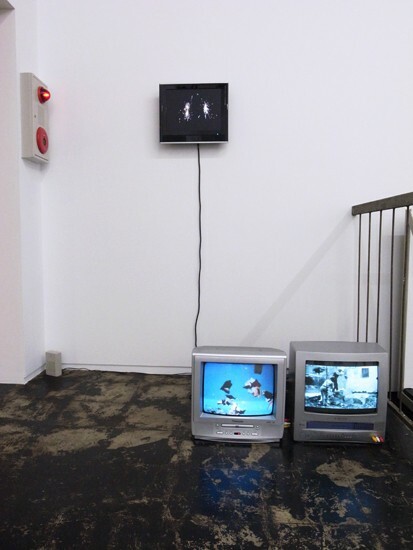 Top: Susanne M. Winterling, Loop in Two (2010), 16 mm film, 1.5 min. Bottom, left: Final sequence of Michelangelo Antonioni, Zabriskie Point (1970). Bottom, right: Lumière Brothers, Demolition of a Wall (1896). 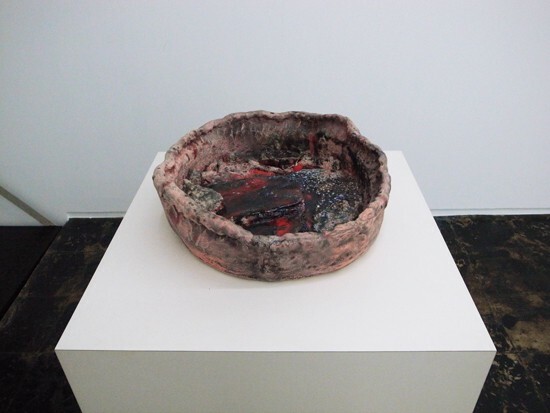 Sterling Ruby, Basin Theory / CNS Bowl 2 (2010), ceramic, overall: 76.2 x 76.2 x 76.2 cm, ceramic: 18.4 x 54.6 x 50.8 cm. 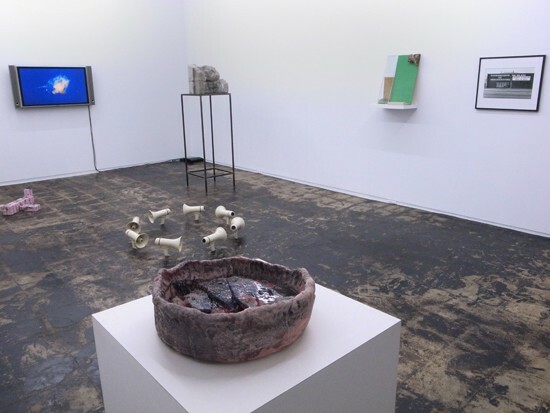 Left: 木村友紀「猫とネズミ、名前はまだ無い」(2009) Yuki Kimura, Puss Gets the Boot (2009), wood, rock, glass, lacquer, 30 x 50 x 62 cm, unique. Right: Will Rogan, Shredder (2010), gelatin silver print, 49.53 X 66.68 cm, edition of 3. 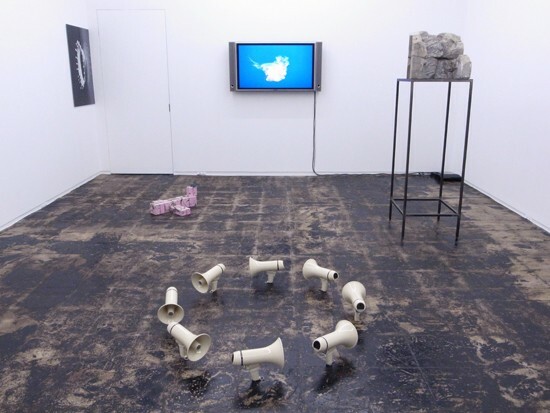 Center, on floor: Miguel Monroy, Whisper (2005), pistol grip megaphones, dimensions variable. Right: Isa Genzken, Berg (1989), concrete with steel base, overall: 164.8 x 51.1 x 55.9 cm. 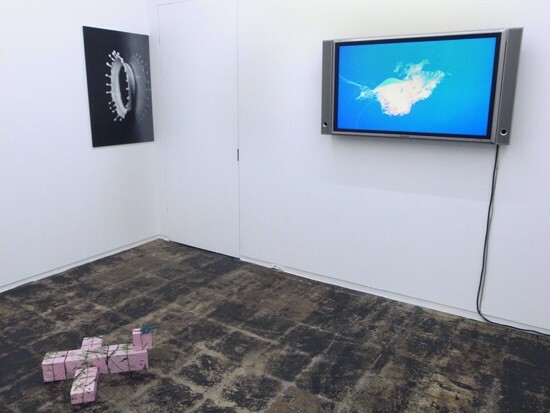 Left, on wall: From Ceal Floyer, Stop Motion (2008). Right: Aurélien Froment, Pulmo Marina (2010), Video HD Cam, 5 min 10 sec. 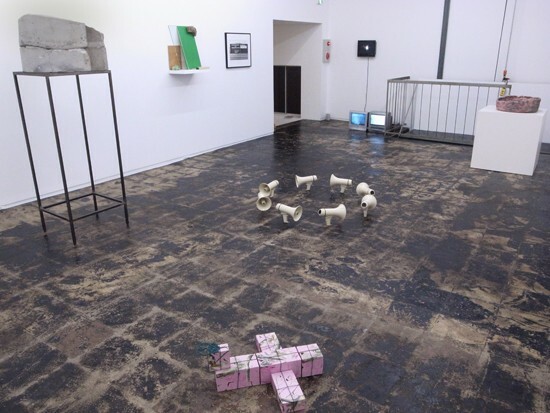 On floor: Christian Holstad, Ohka (When you raise a child as a weapon, it will become a weapon) (2010), plexiglas boxes, camouflage wrapping paper, fuses, dirt, 23 x 64 x 92 cm. 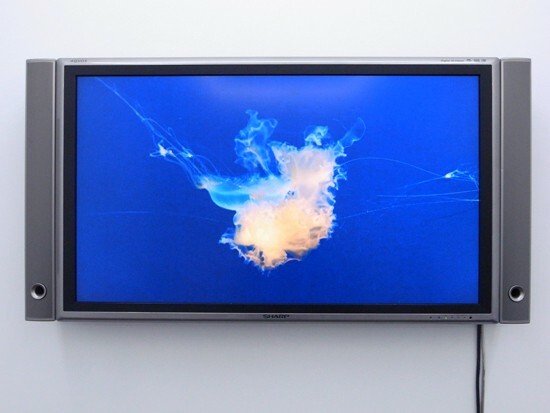 Installation view, Aurélien Froment, Pulmo Marina (2010).